Colorado native Deena Larsen has been a central voice in the writing and understanding of new media literature. Her seminal hypertext, Marble Springs, about the lives of women in a Colorado mining town, was published by Eastgate Systems in 1993. Her work has also been published by the Iowa Review Web; Drunken Boat; Cauldron and Net; Riding the Meridian; Poems that Go; The Blue Moon Review; New River. and The Electronic Literature Collection. Her recent work includes revising and rewriting Marble Springs as the Marble Springs 3.0 wiki. For many years, Deena Larsen hosted forums and workshops for the eliterature community. She currently hosts the website Fundamentals : Rhetorical Devices for Electronic Literature, and her archives, The Deena Larsen Collection, are housed at the Maryland Institute for Technology in the Humanities at the University of Maryland. 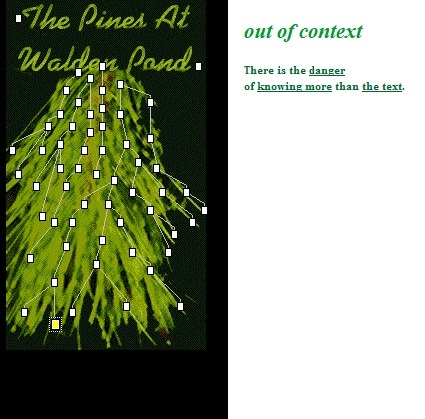 For Authoring Software, she writes about her poetic, image-interfaced hypertext, Pines at Walden Pond. Trellix was/is an early software for the web--before Dreamweaver. It allows users to show node maps and trails between nodes. The squares and lines on the tree are generated from Trellix. I spent a day at the Trellix office and betatested their software by putting Pines together. It went surprisingly fast--this was the only work that I have ever created where I actually spent more time composing than I did re-coding and re-editing and bug fixing.